This old postcard is looking north along King William Street from Darwen Street. 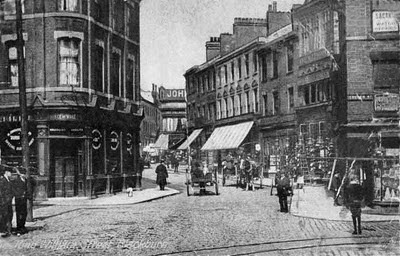 On the left, on the corner of Higher Church Street, is The Prince of Wales Hotel (later to become Burton's Menswear, I think) and on the right, where the tram lines are disappearing to, is Church Street. This is the crossroads, where for decades later, the policeman would stand in white coat and gloves, directing the traffic. Not sure of the date, but it looks to be circa 1905, give or take a few years. I've seen lots of Photo's / Prints etc of this part of Church St, and for some strange reason they all give me the impression that this really was (And still should be) the "Heart of Blackburn Town Centre" (I don't like the new shopping centre !!). You could walk down King William St from the open Market to all the shops along there and then on down Darwen St to even more shops. Or turn left down Church St and guess what.. even "More Shops" !! Behind where the Photographer is standing was the original location of the Market for many years. I think lots agree with your thoughts on Church Street and would, like you, like to see it open to traffic again. The old market was on the site behind the photographer until the 1840's. There's a coloured print of it, elsewhere on my blog/site.